I am a non-technician hoping that you technically literate folk can enlighten me. There seems little doubt that the halo device has justified its presence in the last 12 months. However, there remains the matter of extracting an injured or stunned driver in the event of a crash. It might well be very tricky in some circumstances. It occurs to me that it might be quite feasible to design a halo fitting which would allow it to be swung out of the way quite quickly and easily. What I have in mind is two hinges at the aft end of it and a release mechanism at the leading edge of it, so that it swings open. The pins and catches required could surely be made with more than sufficient robustness. 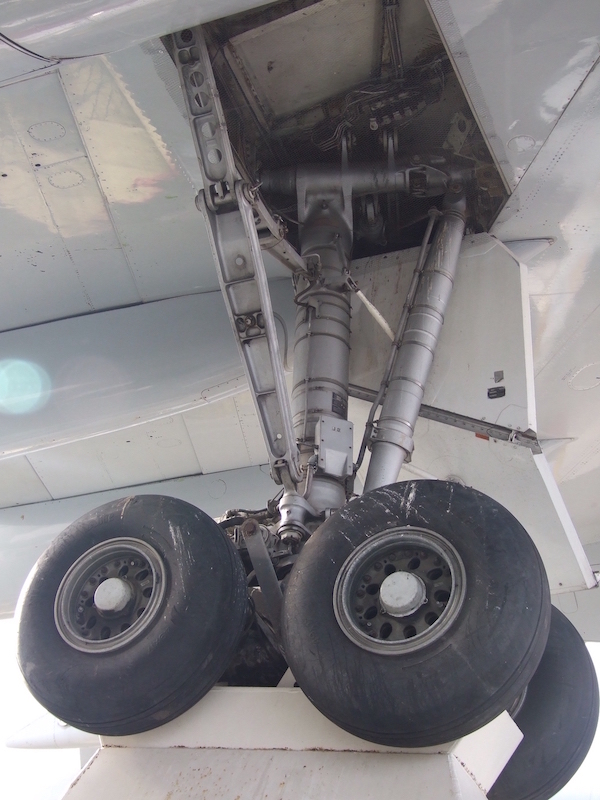 Here, as evidence, perhaps, is an image of the main gear of a Boeing 747. Plenty of hinge pins and release mechanisms here. And decent forces acting upon them all. Edit and help please from a moderator. Could you kindly change 'and' into 'an' in the title? To save my embarrassment. Edited by Gary Davies, 01 February 2019 - 12:32. I believe that if it is required they will cut the halo off. I have to add, that in situations where the halo would be in the way for an extraction that removing it by use of pins would also probably be difficult - such as in an upturned car. In the event of a driver unable to extract himself from a turned over car, the medical staff would stabilise the driver's neck before righting the vehicle. I have seen NO accident where the driver was saved by the thong. Though is fairly obvious that incidents are being caused by lack of proper visibility. I feel any proper quick release thong would be heavy and not as strong. Though for 99% of the incidents would still be strong enough. I will be still a person saying that the thong is stupid and IF they need extra protection a rollcage would be far preferable. Stronger [4 points v 3] a LOT better for visibility and no harder to extricate a unconcious driver than the thong. There was an oo aaah last year where one car drove over the side of another. To me the roll bar would still have done the job and a rollcage a LOT better. The halo is a rollcage Lee. Or rather, if you design a rollcage for an F1 car, it ends up looking like the halo. Fortunately we still haven’t seen the main test of what the halo was designed for. That is, deflecting large bits of debris. I have seen NO accident where the driver was saved by the thong. You need to remove the blinkers Lee. I dislike it at least as much as you, but I cannot argue with results. Le Clerc (the Sauber referred to by jcbc3 above) and Makino have very good reasons to be grateful for it. Were they 'saved' by it? That is hard to prove, but the video seems pretty persuasive. Both drivers were effusive about it. Care to share those incidents caused by lack of visibility because of the halo? I came here to see if there was any discussion about the length of time it took Sainz to exit the burning McLaren on Sunday, and whether this was in any way related to the Halo, or was he just having problems finding the extinguisher button ... ? I think LN has a point about the "thong". Most of the drivers sit so low in the car that there is very little of the head exposed anyhow. Every season there seems to be a few incidents where one car slides over the top of another - and the driver is low enough not to get hit. Nevertheless, all things considered, I would personally rather have the "thong" than not have one. I think Sainz was slow out of the car because he knew it wasn't going to explode like an atom bomb - it's only an oil fire. If the car is upright I think the "thong" would help to speed exit from the car as it gives extra handholds. I have sat in a few cars of general racing types and have found it very difficult to get out at all because there is nothing to grab onto. It may be a different matter when the car is upside down though - the "thong" could be in the way. A 4 point cage may have less visibility due to the forward points, potentially, being in the driver's line of sight for corners. The incident where Alonso's car rode over LeClercs would not have been prevented by the roll hoop, as the McLaren cleared it. You can see that there was no damage to the top of the engine cover or roll hoop camera. But there was great big tyre mark on the side of the halo, left by Alonso's front tyre. The FIA report says that the wheel would have missed LeClerc, but the front wing end plate would have hit him in the visor.